Featuring a more traditional approach to liturgical music, this collection from Randall DeBruyn offers twelve rich and beautifully crafted hymns, anthems, psalms, canticles and sequences. This CD contains twelve rich and beautifully crafted hymns, anthems, psalms, canticles and sequences as well as Randall's popular Mass of Resurrection. This MP3 album contains twelve rich and beautifully crafted hymns, anthems, psalms, canticles and sequences as well as Randall's popular Mass of Resurrection. 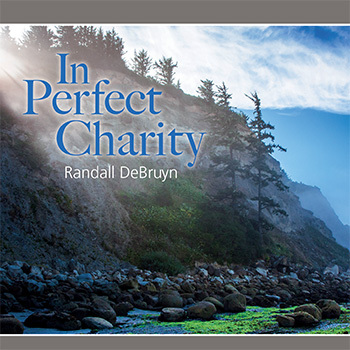 After a lifetime of composing many beloved songs for the Church, Randall DeBruyn continues to build his musical legacy with his first complete collection of liturgical music. Rich and beautifully crafted, In Perfect Charity offers 12 selections as well as his popular Mass of the Resurrection. Taking a more classical approach, Randall reminds us that traditional liturgical music doesn't have to mean archaic and old-fashioned. This collection features beautiful new hymns, anthems and psalms, along with less-commonly composed canticles and sequences that are as engaging and inspiring as they are practical and appropriate. Highlights include "Upon the Cross," featuring a hymn text by Genevieve Glen, OSB, as well as Randall's choral setting of the "Te Deum," the preeminent praise hymn of the Church from ancient times. Arrangements throughout the collection vary from four-part choral anthems to lavish pieces for choir, organ, brass and timpani. The instrumentation is equally varied, with parts for organ, piano, brass and a number of solo instruments. Recorded at St. Mary Cathedral in Portland, OR, under the direction of Angela Westhoff-Johnson, the recording is top-notch. The exquisite choral harmonies and instrument arrangements are the perfect audial illustration of how each song can add grace and richness to your parish worship for years to come.